The grand adventure continues in George Mann's Newbury & Hobbes steampunk mystery series, as a Victorian special agent races across a continent to save his beloved's life on board The Revenant Express. Sir Maurice Newbury is bereft as his trusty assistant Veronica Hobbes lies dying with a wounded heart. Newbury and Veronica's sister Amelia must take a sleeper train across Europe to St. Petersberg to claim a clockwork heart that Newbury has commissioned from Faberge to save Veronica from a life trapped in limbo. It's a rousing chase to save both London and Veronica. Will these brave detectives be up to the task? 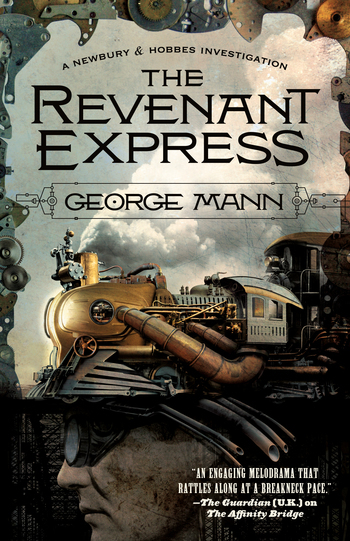 GEORGE MANN is the author of the Newbury & Hobbes Investigations, beginning with The Affinity Bridge, and other works of fiction including Ghosts of Manhattan and official Doctor Who tie-in material. He edited the Solaris Book of New Science Fiction anthology series and The Mammoth Encyclopedia of Science Fiction.